“Forgetting” was unfortunately made easier by the Allied Occupation of Japan (1945-1952). It imposed a strict Press Code on news reports and publication of all scientific research related to the atomic bombings. The avowed purpose was to maintain public order and suppress anti-U.S. feelings that detailed information on atomic horrors might arouse. Keeping the lid on public reports of A-bomb deaths and damages also made it easier, back home in the U.S., to win congressional approval for further nuclear arms development. So grass-roots initiatives took other directions. The Third World Conference (1955) had called for a “white paper” on A-bomb victims’ needs and how to meet them. At a three-prefecture conference meeting in Hiroshima in 1964, Hiroshima journalist Kanai Toshihiro further refined this idea, proposing a white paper on A-bomb victims for presentations to the United Nations. He and his colleagues formed a research group in 1968 that, by 1972, had produced a three-volume catalogue on A-bomb damages. It was testimony to effective cooperation of local governments, research groups, and private citizens. Nagasaki compiled a similar report by 1970. These two efforts gained the support of the nation’s most prestigious scientific advisory body, the Science Council of Japan. The cities of Hiroshima and Nagasaki then backed a compilation committee, headed by three university presidents who, with the help of 34 specialists, brought the sustained effort to fruition in 1979 with publication of the 504-page Hiroshima-Nagasaki no genbaku saigai (Atomic bomb damages in Hiroshima and Nagasaki). The 1981 English edition, Hiroshima and Nagasaki: the physical, medical, and social effects of the atomic bombings (Basic Books, Inc., 704 pp. ), published simultaneously in Tokyo, New York, and London, extended the effort to a much larger world audience. The white paper and resultant publications were aimed at the general public, but another kind of writing was more personal: testimonies penned by individual hibakusha (A-bomb victims, or survivors). As the accompanying table shows, their output increased by two- and three-fold in the years following the peace movement’s split in 1963. Previous peaks had occurred in 1951, the year the Japan–U.S. Peace Treaty was signed; in 1954, the year of the Bikini H-bomb test; and in 1955, the years of the first World Conference Against Atomic and Hydrogen Bombs. Even so, the large postwar output was sustained year after year. Clearly, many A-bomb victims felt that conveying their personal experiences was essential to ensuring peace for the whole world, as well as securing proper care for A-bomb victims at home. 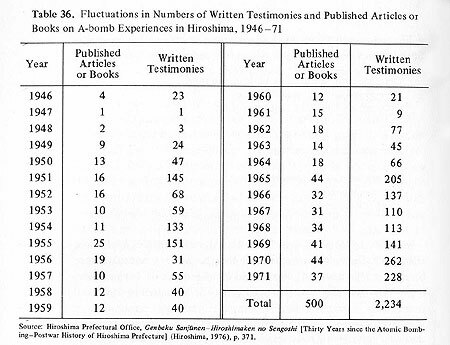 The written-testimony trend has since escalated completely off the table shown above; the official historian at the Radiation Effects Research Foundation in Hiroshima estimated that there were over 20,000 personal testimonies in print (as of 1991). While personal witnessing by the Hiroshima and Nagasaki A-bomb victims has been the wellspring of peace education and action in Japan, additional energy has clearly come from reflection by the Japanese in general on their own disastrous “Fifteen-Year War” stretching from its 1931 outset in China to its Hiroshima-Nagasaki end in 1945. The profound distaste for war has strengthened the Japanese public’s support for the “Peace Constitution,” and especially its war-renouncing Article 9, even if composed for them by General Douglas MacArthur’s staff during the Allied Occupation (1945–1952). Not all Japanese, however, have been inclined, or even able, to deal with Japan’s own wartime cruelty. Apart from the outright unrepentant, there are others who have simply done their best to forget the war and all it involved. day, some insist that the U.S. armed forces in the Far East have introduced nuclear arms into the air and naval bases they still occupy. The U.S. response to this is much too simple—“neither confirm nor deny”—as well as an affront to Japan’s postwar independence. In any case, Japan is still “home” to the Far East command of the U.S., and the memories of Hiroshima and Nagasaki survivors still stand strong against any and all nuclear war-making potential, at home and anywhere else where humans live.